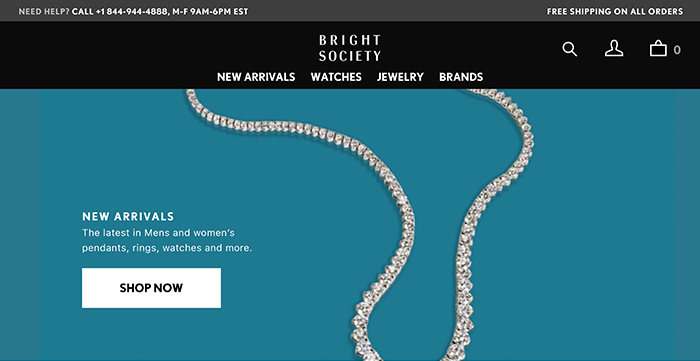 E-commerce platform Bright Society launched in 2017 to aggregate exclusive fine jewelry and watches from small independent jewelry stores across the United States. The company’s general manager, Joe Mellet, and vice president of marketing, Lauren Kennedy, offer a look at Bright Society’s origins, including the opportunity they see for this type of retail model, its role bringing back business to small brick-and-mortar businesses, and how the online platform was financed. Q. What was the inspiration behind Bright Society and what did it take to execute the concept? Sales growth within the jewelry industry is happening exclusively online. The result is stagnant in-store sales and an annual store closure rate of 4 percent, an all-time high. Unlike other industries, brick-and-mortar jewelry retailers have not had a viable option for selling online. While these independent jewelry shops house collections that are second to none, most of them lack the financial resources and technical expertise necessary for building a profitable e-commerce business. So, we set out to create a solution. Unlike other industries, brick-and-mortar jewelry retailers have not had a viable option for selling online. The execution of our vision has been exciting and challenging. We’re offering a two-sided marketplace for sellers and customers, which meant that we had to design, test and perfect functionality for not two but three user groups, when you include the features needed by our team. Work began in January 2017, and since then, we’ve launched three unique interfaces: a backend for stores to list and manage inventory, an app for stores to take and submit photos of their items, and an e-commerce site for customers to buy the product. Q. What problem is Bright Society trying to solve? How do you expect it will impact the jewelry industry as a whole? In bridging the gap between brick-and-mortar jewelers and global consumers through one digital shopping destination, we’re actually solving two problems: First, while we love our retail partners, there are a few shortcomings in the their model that we think we can improve. Stores usually carry a limited selection and operate limited hours because of security concerns. Bright Society addresses these issues by providing a platform where jewelers can offer as many items as they choose and make them available 24/7, allowing customers to browse and purchase whenever it fits their busy schedule. Second, an online sales platform is only helpful to a retailer if it’s easy to use. We’ve gone to great lengths to make both our site and our processes intuitive and efficient. As a result, we’ve eliminated any barriers to participation that might have kept jewelers from partnering with us. We wouldn’t dare speculate how Bright Society will impact the industry as a whole. What we do know is that consumer behavior is changing. Watches and jewelry was the fastest growing e-commerce segment last year, expanding by 39 percent while the second-place category grew just 28 percent. We are committed to embracing change as our industry evolves and we are committed to listening to our customers and retail partners as we plot our path into the future. Q. How did you finance the development of the platform? Perella Weinberg Partners provided seed funding via White Pine Trading, an existing portfolio company in one of its private equity funds. White Pine also provided office space, infrastructure and back office services to speed our time to market. Q. Do you have plans to seek outside financing for future expansion efforts? Yes, we’re currently raising a Series A round from institutional venture capital. PWP and White Pine were great strategic partners in our early days because of their expertise in the wholesale diamond and jewelry space. We want our next group of investors to add value and expertise in the e-commerce, technology and luxury spaces. Q. Bright Society positions itself as both store and service. Can you speak to the two sides of the business and how they work together? The store provides consumers access to a first-of-its-kind assortment of fine jewelry and luxury watches. From independent jewelers nationwide, the store aggregates the finest selection of pre-owned and new products across vintage, custom and branded categories, all with price points above $500. Our product concierge service helps customers find specific products that are not listed on the site or products that meet general characteristics that they provide. Q. What was your biggest challenge in developing the platform? From the beginning, we knew photography would be our biggest challenge. It’s hard enough to produce great photos in a professional studio, and our high standards made the task even more difficult. We needed to develop a system in which retailers could take beautiful photos of their merchandise using any mobile device and have them automatically upload to our server, after which our team would make any adjustments necessary to ensure the image captured the piece in perfect color and clarity. Thankfully, we were able to meet our objectives. When you look at an item on our site, the pictures you see are real photos of the actual item. We don’t use stock photography or CAD images, we don’t reuse photos, and we don’t airbrush out flaws or blemishes. We found a way to capture enticing and accurate images through a process that met all of our requirements. Tackling this challenge was the first step to bringing our concept to life. Joe Mellet (left) is Bright Society’s general manager. Lauren Kennedy is Bright Society’s vice president of marketing.